I didn't care much for Batman v. Superman: Dawn of Justice when it hit theaters. I found it messy and disjointed. I really didn't have much of a desire to see it again. Anecdotally, when I go to see a Marvel film, people stick around for the credits. They know an after-credit sequence is coming or there's something Marvel has thrown in there as an Easter egg. When the credits rolled during my BvS screening in March, people couldn't wait to get out of the theater (myself included). I thought the character motivations were murky and poorly drawn. I thought Jesse Eisenberg was beyond annoying as Lex Luthor. Batman's visions were weird and out of place. The Martha Moment was contrived and silly, as was the battle between our titular "heroes." Luthor's grand master plan made zero sense. The congressional hearings convened about "Superman's Great Adventure in Africa" didn't make sense. Bruce Wayne/Batman dominated the screen time, shortchanging Superman in his own sequel. Snyder says there's a three-hour cut of the movie that he wanted the studio to release, but the studio balked at the running time. I think a solid 45 minutes of this movie could've been cut; I can't imagine three hours of it, unless that three-hour cut has tons of character moments that are lacking in the theatrical version. It turns out Batman v. Superman: Dawn of Justice: Ultimate Edition does exactly that. 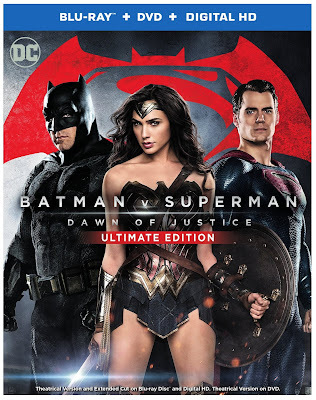 I had a 50% credit from Google Play that expired on July 1, so I bought BvS: DOJ: UE (ick on that title, WB!). I will never go back to the theatrical version, though I should probably watch it one more time to see if it holds up any better now that I've seen the Ultimate Edition, which is a far, far superior version of the film. As it turns out, the 30 minutes cut from the movie were almost all character moments, many of theme featuring Clark Kent/Superman. Luthor's manipulations make much more sense; while Eisenberg is still grating at times, his Luthor comes off as more of a master manipulator and sinister force, something the theatrical Lex Luthor lacked. Even Bruce Wayne/Batman, who I thought was the best drawn character in the theatrical version, comes off as an improvement. We understand even more that this Batman is broken; the death of Robin years ago embittered him, and he's not in his right mind. Luthor uses this against him, and that Martha Moment is what breaks Batman out of his fevered psychosis; he realizes Luthor has manipulated him, and it changes his entire conception of Superman and his desire to kill him. It's not just as simple as, "Hey, our moms have the same name--we're best friends now!" I'm not saying the Martha Moment works on every level, but it has a better payoff than the theatrical version because Luthor, Batman, and Superman are better drawn in the UE. The moment has more impact and you understand Batman's quick turn; he misunderstood Superman because he was embittered and manipulated. The Martha Moment snaps him out of it. He's willing to give the Kryptonian a chance. So when Bruce Wayne says he's failed Superman in life, you understand; it has more impact. Clark Kent is also more clearly drawn in his version. One of the biggest complaints I had about the movie was the central conflict between the two superheroes. I wrote in my original review that the conflict should have been one of ideology; not one made because Lex Luthor kidnapped Superman's mom. While Martha Kent's abduction is still the regrettable crux of the Superman-Batman fight, it's not the only reason behind it. Clark Kent spends more time as a reporter in the Ultimate Edition as he tries to track down the Batman and investigate his impact on Gotham City and Metropolis. The Bat-branding, we learn, is another of Luthor's manipulations. An inmate died because Luthor ordered it, making Batman's new, more brutal methodology look even more so. Clark talks to people in the neighborhood frequented by Batman; some of them are scared while others say you have nothing to be worried about it as long as you're not doing something bad. The girlfriend of an inmate who was Bat-branded and killed in prison tells Clark there's no reasoning with Batman; he only understands violence. This goes a long way toward establishing Superman's viewpoint on the conflict, something that was implied but not really touched upon in the theatrical version. And as for that bizarre Africa situation? This is one of the most important changes in the reworked version of the film. Luthor manipulated the whole plot (we see Lois Lane, yet another character who suffered from a lack of development in the theatrical version, investigate the Africa incident and put the pieces together). His people made it look like Superman killed several people, using a flamethrower to simulate heat vision. The bullet subplot, a weird side story in the theatrical cut, makes more sense now. In the theatrical version, you don't understand why the bullet is important--if Superman killed several people, he sure as hell wasn't using a gun. The UE fixes that; the bullet is important because Lois believes an outside force, possibly one connected to the government, masterminded the Africa situation. And another subtle plot point--that Superman doubted himself because he didn't see the bomb in the hearings--gets an explanation: the wheelchair was made of material that was lined with lead and thus impervious to Superman's X-ray vision. Superman, who thought he'd been careless, hadn't missed it because he wasn't looking; he missed it because he couldn't have seen it. Lois also figures out that the anti-Superman character played by Scoot McNairy couldn't have planned the bombing by himself. Luthor manipulated the poor man. Somehow, the three-hour version of a movie I didn't think I'd want to see again turned out to be a far superior version of that movie. If the theatrical version was a five for me, I'd give the Ulimate Edition an eight. It made that much of a difference to me. Even Superman's death, which I felt was shoehorned into the movie to give it a "big dramatic ending," means so much more. Clark Kent/Superman says the earth is "his world" and will do whatever is necessary to protect it. That motivation felt lacking in the theatrical version, but in the new cut, his words carry so much more weight. The movie isn't perfect. It's still flawed. If you hated the original because of the tone or because you don't like the direction of the DC Cinematic Universe, then this new cut won't change that. The characters are still dour and the tone remains dark. You won't find many moments of levity among the film's aspirations to pose philosophical questions about the nature of heroism and the impact a godlike being would have upon the world. There are also things I don't like about the movie. While the "Knightmare" is a cool sequence, it still feels out of place and the Flash's brief cameo comes out of nowhere. Lois Lane's role in the final conflict is pretty damn stupid; she throws the Kryptonite spear away and then has to go retrieve it. She gets trapped underwater and has to be rescued. Surely there was a better way to do this. The Batman-Superman fight still comes down to the fact Lex Luthor kidnapped Superman's mom (in the ultimate cut, however, this feels like a necessary tipping point for Superman as opposed to his entire motivation for the fight). The Martha Moment, while much more impactful, still has problems. Who calls their mother by their first name? A dialogue tweak would've fixed this ("My mother... he's going to kill my mother... save her... save Martha Kent."). Also, Superman goes into berserker rage mode too early in the Batman-Superman fight. He does try to talk to Batman and explain things at the very beginning, but he gives up on the idea much too quickly. Another line or two of dialogue (along the lines of "Bruce, you have to listen to me. Luthor's pulling the strings. He's got my mother.") would've helped. I understand now that Batman is too far gone to listen to reason--he's made up his mind--but the audience needs to be shown it. We need to see that this is a fight Superman doesn't really want. While Wonder Woman is fantastic--probably the highlight of the movie and one of the few "fun" things about it--having her sit down to watch YouTube videos of other potential Justice League members was clumsy. Actually, you can pretty much tell when something teasing a Justice League movie has been shoehorned into BvS because it usually doesn't work that great (The "Knightmare" and Flash's portentous appearance, Wondy's fun with YouTube, etc.). Listen, Batman v. Superman: Dawn of Justice will never be a fun movie. It'll never be Captain America: Civil War. The conflict between the two heroes, while more impactful in the new cut, will never have the sad gravitas of Tony Stark vs. Steve Rogers because we've spent so much less time with Batman and Superman than we have with Iron Man and Captain America. That said, if the theatrical cut of BvS left you scratching your head, give the Ultimate Edition a look. You may actually like it.